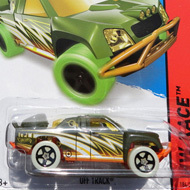 116/250 is part of the HW Off-Road series and the 2014 Treasure Hunt set. The car boasts dark blue metalflake paint with blue flames and stripes. 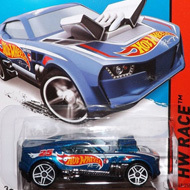 The sides also have the low production symbol and the Hot Wheels logo. It has blue tinted windows, a grey interior, black Muscle Car 5-spoke wheels with copper rims, and a chrome plastic Malaysia base. This custom car/truck hybrid features twin jet engines in the bed with air intakes on the hood and roof. 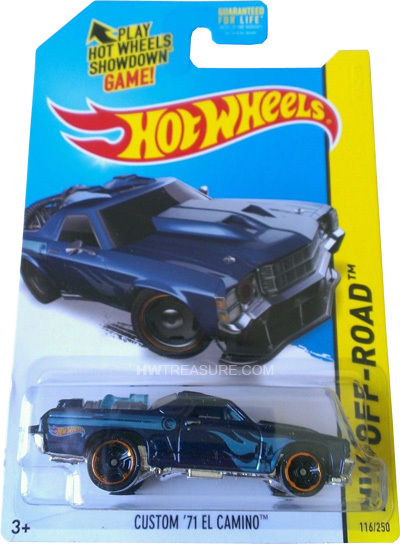 It made its debut in the 2012 New Models series and is the fourth El Camino to be a Treasure Hunt. The others can be found in 2003, 2011, and the 2013 Super set.